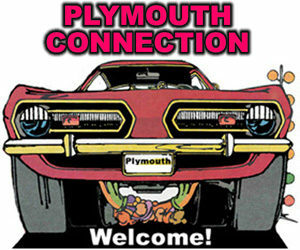 Welcome, the Plymouth Vehicle Enthusiast Connection is a online world-wide, community dedicated to the preservation, restoration, and enjoyment of Plymouth cars and trucks. The connection was built to promote member sites of the Mopar Enthusiast Ring specializing in Plymouth brand vehicles and topics. Types of site include Plymouth Barracuda, Plymouth Belvedere, Plymouth ‘Cuda, Plymouth Duster, Plymouth GTX, Plymouth Fury, Plymouth Road Runner, Plymouth Valiant, Plymouth Satellite, Plymouth Superbird sites and more. Cruising the connection is a great way to locate Plymouth related information, web sites and owners on the internet. We are a proud group of automobile enthusiasts with a common interest of preserving and enjoying our classic and modern Plymouth vehicles. The Plymouth Vehicle Connection Member list is 100% comprised from member sites and pages of the Mopar Enthusiast Ring. Hand picked by the Ringleader, only member sites with pages or resources devoted to Plymouth vehicle topics are considered. The Connection also features a great link section to other non member Plymouth car and truck resources. Have a Plymouth brand vehicle web site or page and want to get listed? The Connection is a great resource for promoting your site or page To be considered for the list you have to be a member of the Mopar Enthusiast Ring in good standing. Joining is totally free and is a great way to get more people to visit your Plymouth vehicle site or page. For more information on joining visit here. Introduced in 1928, Plymouth was Chrysler Corporation’s way of offering a low-cost alternative to the upscale Chrysler-brand cars. Plymouths were originally sold exclusively through Chrysler dealerships. Due to declining sales the Plymouth brand was discontinued in 2001. The Plymouth Vehicle Connection is part of the internets oldest and largest Mopar Enthusiast Ring, featuring over hundreds of Chrysler, Dodge, Dodge & Ram Truck, Plymouth and Mopar sites and pages. Including a collection of Mopar related Clubs and Parts & Services sites. The mopar-ring.org server also hosts some other cool Mopar related resources. Including a Classifieds section, Photo Gallery, Screensaver section and a news section.